November 21, 2011 in "japan"
There were two handle-less cups in front of me. One was an emerald green on the outside but white within. It was empty apart from a few dregs of damp green leaves stuck to its bottom. The second, wider cup, was made of porcelain in a light brown with leaves etched onto its surface. It held a freshly brewed black tea. Transferring my attention to this more promising item, I lifted the cup by pressing both sets of fingers to its rim and sipped. "Did we need to change cups?" the woman sitting beside me inquired to our host, a Japanese lady who was the librarian in the Physics department. She had kindly invited me and the other female foreign professor in the department to her house for dinner. We had eaten nabe; a dish in which multiple foods are cooked in boiling water on a portable stove placed at the centre of the table. Our nabe had contained chicken, scallops, tofu and noodles. Removing chicken from the bone with chopsticks while trying to maintain the very greatest of manners was not easy. I wasn't totally sure I had succeeded. Still, no one had reacted in horror and thrown me off the balcony and some days, you have to consider that a success. We had now moved onto tea, an area where I felt far more confident. I was British after all. The British understand tea. I had presumed that we had been offered clean cups because the tea blend had changed. I personally would have been happy using the same container, but there was a delicateness to the way our host had added boiling water to a jug before dividing it perfectly between the three cups that suggested such reuse would be a crime against nature. Our host however, shook her head. "There is no rule," she told us. 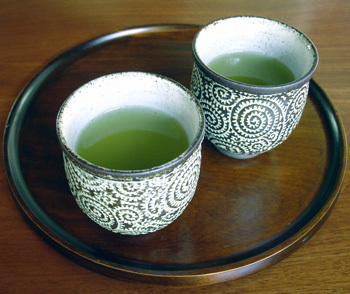 "But green tea looks best when it is in a cup with a white interior." She indicated the pale ceramic of the empty vessels on the table. This elicited a nod of deep understanding from the other professor. If I was strictly honest, I couldn't see much of a difference in shade between the inside of my first cup and the one I was holding now. This probably suggested I was barbarically uncultured. I examined my tea. This in itself was a strange act. Rising from the table, our host opened a cabinet that seemed to contain a wide variety of different crockery. She held out a red cup. "This would be bad for red tea," she told us. "But good for coffee." I sadly concluded I did not in fact understand tea. There was a whole school of aesthetics that our brown teapot at home had never fully epitomized.